Wednesday, April 11. Time 9am. Temperature 45, and a west wind blew. The tree was completely leafed out. An adult stood just inside the nest, obviously tending to young. The other adult wasn’t anywhere around. I opened the door to take pictures of the nest and heard another eagle repeat its “kleek” calls. I didn’t pay any attention to the direction the calls came from or look for the other eagle. I took several pictures and then eased the truck up a little closer. She was definitely feeding young. She’d bring her head up. Her beak would open and close quickly, and then she’d lean down again. I wondered what the prey was that she had in the nest to feed them. This continued for a few minutes. I drove on past the nest and turned around. An eagle flew to the east, toward a large body of water, and maybe on from there. I lost sight of it. Then when I passed the nest, the adult was gone (probably the one I just watched flying east). Another large bird flew to the north. No matter how hard I tried to turn the large bird into an eagle, it was still a great blue heron. The blue-gray on top of its wings was obvious with the sunlight hitting it. Either the adult was hunkered down in the nest when I passed (which I doubted) or was out hunting for food. This must mean the young were old enough to keep themselves warm. I couldn’t imagine the adult going far for food or leaving the eaglets unprotected for very long. Of course the eaglets were probably hunkered together. The sunlight warming them. The nest would also be adequately lined for warmth. 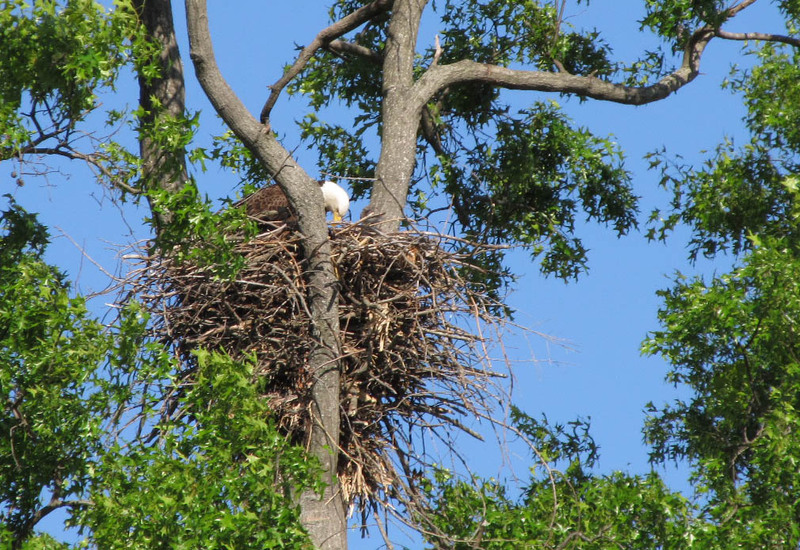 As I left I wondered if there were 1, 2 or 3 eaglets in the nest. It would still be nice to have a periscope to see down into the nest. Patience was never one of my better virtues. 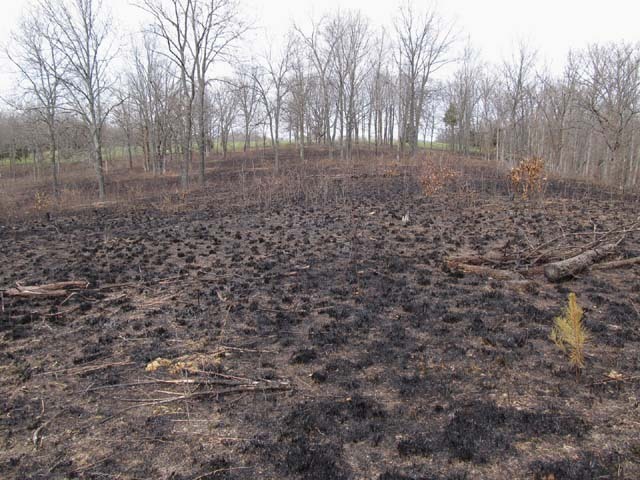 The state did this prescribed burn of my barrens (similar to a prairie) on March 3. 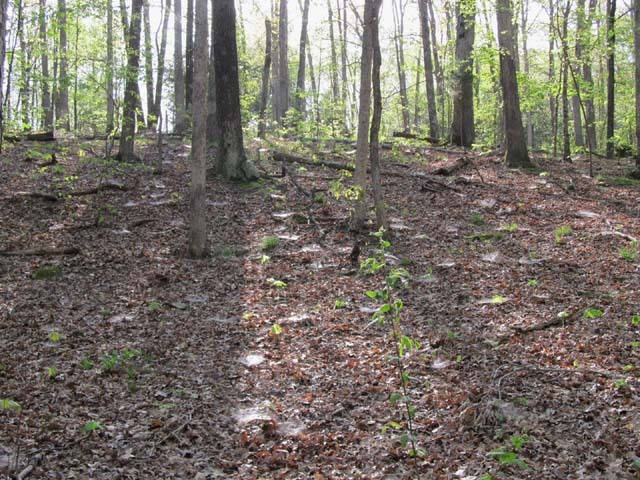 They burned the whole barrens, into the woods and down to the creek. 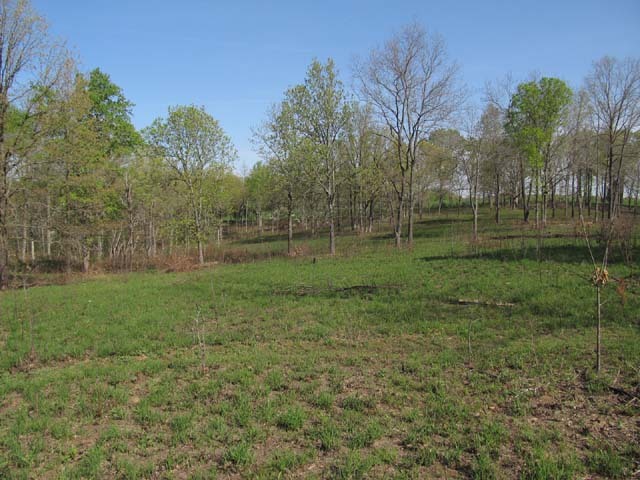 The barrens soon started greening with a warm winter of confused seasons. It may look harsh but it will be a thing of beauty in no time. Grasses will be taller, flowers will bloom in profusion, unless there’s a drought. 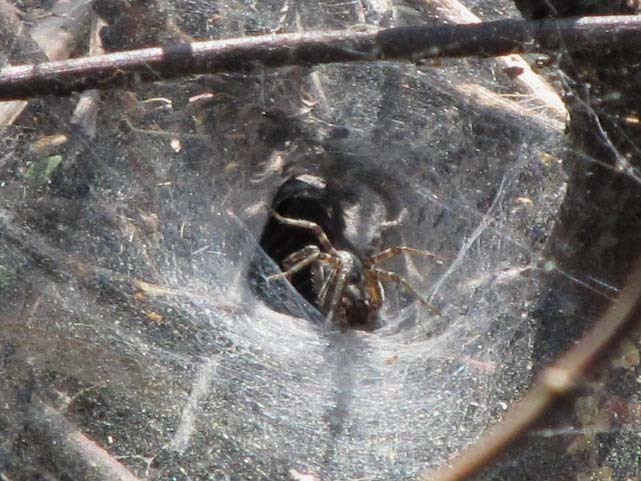 Funnel weaver spiders are also called “grass spiders.” They build their webs close to the ground and hide in the mough of the opening. The web’s not sticky. 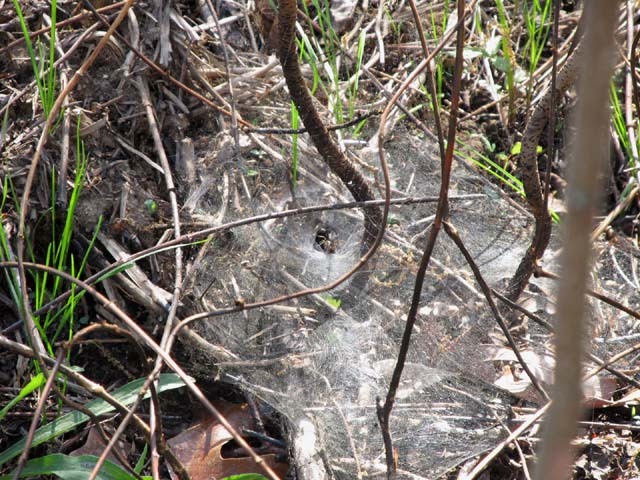 It causes a vibration when an insect, spider or other creature crosses the wide part of the web. The spider feels the vibrations and rushes out to grab its prey. The spiders have 8 legs and 2 body parts (cephalothorax and abdomen). 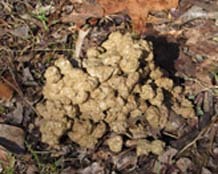 They have pairs of eyes, hairy body and legs, and body length to about 1 inch. From a distance this Blanchard's cricket frog looked like it was hung out to dry. Buffy and I started on the trail around Jones Lake (Saline County Conservation Area). The sky was vivid blue with an occasional puffy cloud. 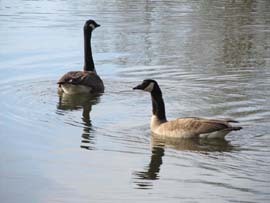 A pair of wood ducks swam out in the middle of the lake, and a pair of geese stayed close to us, honking as they swam. 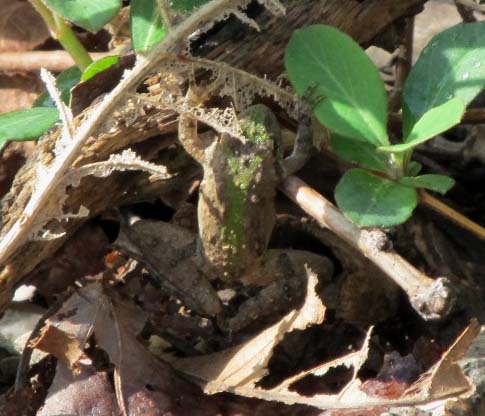 A small frog jumped into an area of sticks and honeysuckle. “Hang out to dry,” immediately came to mind because of how the frog’s postition looked from my angle. I knew if I moved closer, it would jump. Frogs usually aren’t cooperative. I know from past experience to take pictures, then ease a little closer, then take more pictures, etc. (Later when I had the picture in computer I saw that the frog’s hind legs were supported.) It’s position sure looked funny from my perspective. Buffy and I walked on. Occasionally a larger frog jumped from the bank into the water. A snake slipped into the water. Its head poked up by a plant. It saw me and slipped back in. Minnows caused little ripples near the shore. None of the 3 butterflies I saw ever landed. 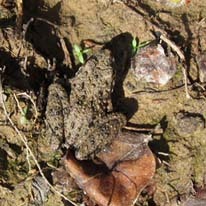 Another small frog jumped (picture below). This one was smaller and quite difficult to see, much less locate with my camera. There’s no finding these little ones unless they jump. Crawdads had been busy after last night’s storm. This and another mound I found earlier were shiny-wet looking. This is the first I’ve seen that showed how the mound was made with balls of mud. The closed top will keep out any more rain. One time I was in the backyard after a strong storm had passed. Water filled a crawdad hole to within a couple inches of the top. A small piece of bark floated in it. The crawdid (which I couldn’t see) used one of its antennae to slowly push the bark back and forth, playing with it. 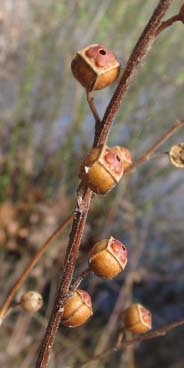 These seedbox capsules (left) have probably been used in designs for trinket boxes. Seedbox (Ludwigia alternifolia) grows in wet areas and has yellow flowers that bloom June through August. The Canada geese decided not to follow us any more. Buffy and I headed back to truck. We still had more things to find. An outing isn’t over until we’re home. Male perched close, protecting its nest. 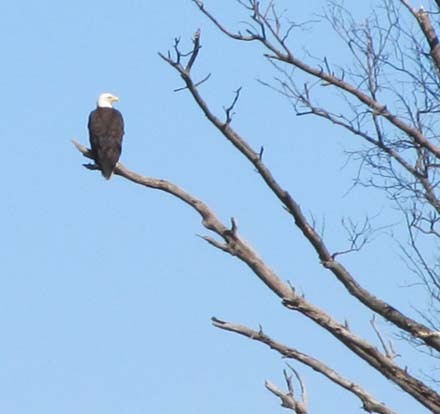 Buffy and I took a morning drive to check on a pair of nesting bald eagles. The morning was sunny, with light wind and temperature in low 50’s. 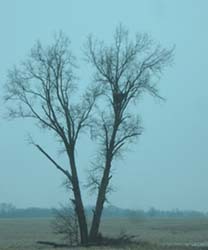 I saw the male eagle perched in a tree before I even turned off the highway. It was perched in a row of trees along a fence line perpendicular to the highway. 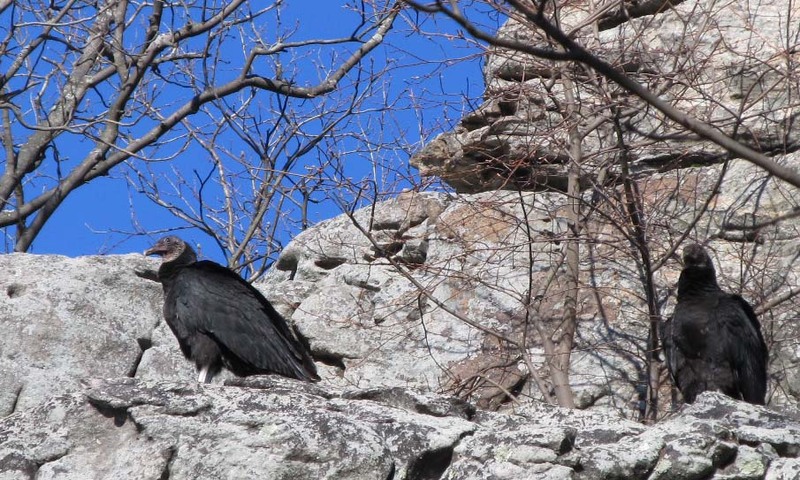 The nest was across a blacktop road further back from where male was perched. 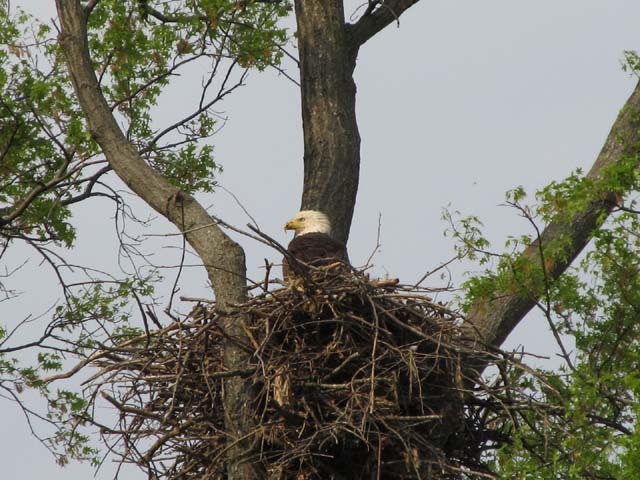 The female’s white head was just above the top of the nest. I only go there about every 2 weeks or so because I don’t want to stress the eagles. I know there must be many others interested in them too. 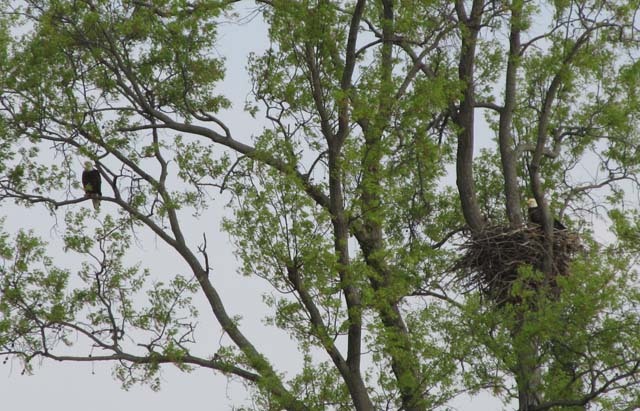 A strong storm last year took down the right trunk of the cottonwood tree and the nest with it (see picture below). The young didn’t survive. So, it was a pleasant surprise to find that the pair had built a nest in the remaining trunk. I vividly remember the first eagle I ever saw. It was near its nest too. My youngest daughter and I were on a Christmas bird count in the closed area of a refuge. We even got to eat lunch there and watch the eagles across the inlet. Eagles numbers were low back then. Bald eagles get their white head and tail when they’re 3-4 years old. They mate for life and can live to 30 years in the wild. Their diet consists of fish, small mammals, especially rabbits, waterfowl, and carrion. 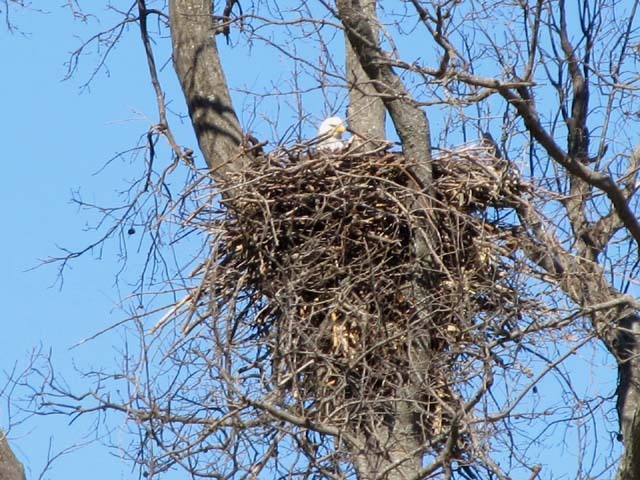 They build their nest 30-60 feet high in the fork of a tree. She lays 1-3 bluish-white eggs (usually 2). The eggs are incubated for 34-36 days. Eagles are semi-altricial. Altricial means the eaglet is incapable of moving on its own after hatching. The young take their first flight when they’e between 10-13 weeks old. I found out in my research that eagles have hatching asynchrony, meaning they begin incubating when the first egg is laid. This results in a size difference between the first and last to hatch. I found a barred owl nest years ago in the cavity of a dead tree. I watched the 4 owlets taking turns perching on a horizontal ledge of the nesting cavity. There was considerable size difference between the youngest and oldest. The youngest lacked the balance of the older ones, and had to keep grabbing the side of the opening, with its beak to stabilize itself. Norfolk Botanical Gardens in Norfolk, VA has a website — www.wvec.com/eagle/cam. They have 3 video cams set up close to monitor to nesting activities. You can watch the eagles in real time. You can ask questions on their open chat, and view slide shows of previous days and last year. And if all goes well with the nesting this season, I’ll be following this pair in my blogs.